This next step falls under the “O” of PROCESS. O stands for organize and that includes the very important purging stage. I might need it one day…. I don’t want to hurt so and so’s feelings…. I don’t want to seem ungrateful…. Do you know how much this is worth….. It brings back so many memories…. Yes these are all great reasons and you know what…. if you have the space then by all means organize your stuff into designated areas and call it a day. However it isn’t always as easy at that because I have found that “pack rats” will quickly fill any space no matter what the size……the “stuff” eventually overwhelms the space. At this point your stuff “owns” you and not the other way around. You need to take back the control because the one thing you have to remember is it’s just stuff. The questions to ask yourself include “Do I use it regularly, do I love it and do I have the space to store it?” If the answer is well no BUT (place any excuse from the above list here), then you need to examine your motives for wanting to keep it. The bottom line is why surround yourself with “stuff” you don’t use or love? This is what I like to call negative energy. Negative energy manifests itself into chaos, confusion, resentment, unhappiness, discontent, etc, etc, etc. Designate space for the things you love and use and get rid of the rest. It’s okay to give yourself permission to be happy by ONLY surrounding yourself with the things that bring you joy and provide you with order, function and efficiency on a regular basis. I might need it one day…yep thats true but if you haven’t used it in a year chances are good you won’t need it anytime soon. You have to weigh the cost between the prime real estate space it takes up and the cost to replace it if by whatever chance you do need to purchase it again. I don’t want to hurt anyone’s feelings by getting rid of it….okay fair enough….but I would assume the person you don’t want to hurt is close to you or otherwise you wouldn’t be so concerned about their feelings and if that is the case then how much worse do you think this person would feel knowing the additional stress they’ve put you under. If you are keeping something to avoid hurting someone’s feelings you are essentially being a storage house for them. You are giving up storage space in your home to make them happy. I’m sure you can think of many different ways to effectively use your space. Do not be burdened by stuff you are keeping for someone else. I don’t want to seem ungrateful……another biggie. It’s all about heart….if your heart is in the right place the giver will hopefully understand. You need to do what’s right for you and your family. You don’t always have to tell the giver that you and the item are parting ways. Re-gifting is a popular choice for new items as well as donating items to thrift stores….take it to the thrift store in the next town if you are really worried about it. Oh and don’t forget places like Craigslist or Ebay….just don’t hang onto something out of a sense of obligation…..it only harbors resentment. It was so expensive…..yes the ol big ticket item we just had to have and there it sits collecting dust….that happens to all of us and you know you’ll never get back what you paid for it but again you have to remember that item is taking up space in your house that more than likely could be used for something else…..which makes THAT piece of real estate more expensive than the item you are hanging onto! Think about it. Do you know how much this is worth….it’s not worth anything if its just sitting in a box….if it isn’t something you love or use regularly get rid of it and make some money on it now. It brings back so many memories….ahh the emotional attachment….this one is probably the biggest culprit that holds people back and so I’ve saved it for last. Our memories are so wrapped up in physical material possessions…..that isn’t where the memory is and you know it. It’s in your heart…the stuff just triggers the memory for you….so many of us are afraid we will forget. I can understand that and I suggest that you take a picture of the item and allow the picture to conjure up the memory for you instead. For example, I have kept the Woody doll my son picked out when he was 2 years old prior to going in for major surgery. Thankfully the surgery revealed that my son didn’t in fact have cancer like the Drs. had originally suspected and so this small little Woody doll holds all the emotions that surfaced during that difficult but triumphant time. I get it. For this reason I keep one tote in the top of each of my kids closets for special “memories” and other keepsakes. Another thing, pay attention to your inner dialogue. For instance, when you are dusting your knick knacks or tripping over your floor clutter and are mumbling and grumbling about it every time you do it, why not do something about it? Less knick knacks equal less clutter equals less dusting. If it isn’t making you happy then pay attention to that. Just don’t keep repeating the same negative pattern over and over. Do something different. When I do an organizing job and they really want to keep a particular item, I don’t have a problem with that however it will almost always have to be at the expense of something else. What are you willing to give up to keep that particular item? Pretty soon what you really love and use will become apparent. Do I use it? How long ago did I use it? Do I have the room to store it without it being a cluttered space? Am I willing to give up something else in order to make room for it? Can I imagine myself or anyone else in my family ever loving it or needing it in the foreseeable future? I recently asked myself these questions when trying to decide between two pieces of serving ware. I am certainly not saying any of this will be easy. It does take discipline for sure but if you remember to start small, not beat yourself up or get too overwhelmed, you can do it. How are you making out on your space? What’s been the hardest thing to part with? One year of The Home Office Organizer VIP Membership ~ The Ultimate Home Office Maintenance Program designed to help you stay on task while organizing your office in small steps. 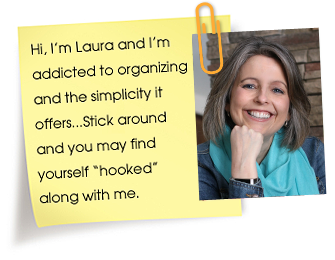 A seat in the 28 Day Declutter Happy Hour Premium E-course ~ helping you clear the physical and emotional clutter that gets in the way of decluttering and getting organized. Laura, this is a great post. Thank you. I really needed it to getting me moving along with the challenge. I find it hard to part with the special memories items. Must. go. purge. now. You can do it Joyce!! I forgot to sign up for the challenge…. is it too late? I ‘ve been working on my space! This is so important to read! I am proud of myself in some respects – I have purged about 1/4 of my wardrobe (we have a small bedroom closet so I was using the even smaller closet in my sewing room to store out of season clothes, now, if it doesn’t fit in the bedroom, I don’t get to keep it!) but am finding other areas of purging so very difficult. As a teacher who keeps getting shuffled around to different grade levels every year (I have only been teaching 8 years and have taught every grade level from pre-school to Grade 5) I have boxes of grade-specific items that are hard to give away. They took so much time and effort to create, and I keep giving away things only to find myself teaching that grade again a few years later and having to make/buy everything all over again, which makes for a very busy and expensive teaching year! I like your idea of “weighing the cost of the space” versus needing to purchase items again (or the time required to make the items again), and the stress of having it take up so much space in a small house. Another consideration to add to your list that keeps coming up for me – “If I keep this item, what other item do I have to give away in order to make space for it?” I discovered I’d rather give up my extra clothes than my grandmother’s fabric. I still have a long way to go, but it’s a start! Yes, what is most important to each of us will be different for sure. Clutter becomes a problem when we try to keep everything and we just don’t have the space to do so. I can totally see why you would want to keep your teaching materials and maybe you can find an acceptable storage solution that contains it all in one central location to fit the space you have available. I was so in tune with what you were saying and then I saw all the happy face cups smiling at me and I lost it! I collect anything smiley. So reading about getting rid of clutter and then “wanting” all those cups was kind of an oxymoron! LOL! But seriously, great advice and I could use all those excuses but I’m going to try to move past it! LOL, I know I’m sorry about that Kim but I laugh because I use to collect all things happy face also. I love them too! I recently parted with most of it and only kept a few special pieces. It was so hard to do that is for sure. We got married at 22 and let’s just say when I was registering for everyday china, I wasn’t thinking 10 years and 3 kids later 🙂 I don’t like my everyday china and have replaced it with something inexpensive that I actually like and that goes with our lifestyle and kitchen. But, I am finding it hard to part with the old stuff. I guess part of it is sentimental, but alot of it is the big ticket item issue. I know how much this stuff is worth and how much people paid to give it as wedding gifts to us, but I haven’t found a good way to sell it. Any ideas for hard to sell items like that?? Have you tried Ebay or Craigslist? Someone might have the same pattern and could be looking for extra dishes. You may not get what they are worth, but at least you could get something for them. There is a company in NC that buys and sells “replacement” china, crystal etc. It’s called Replacements Unlimited. Ok….I need to do all this so bad! Is is too late to join the challenge? No not at all. There is no requirement to pre-sign up. Great post! I need to keep a list of those questions handy through out the house. The hardest thing for me to get rid of is some things that were my moms. It’s stuff I know I will never use and the only real memory it has is that it was something my mom used. I have a few of her favorite and my favorite things already, but it is still hard to get rid of the unnecessary items. Rana it’s okay to keep a few favorite pieces if you have the space for them. It’s when it becomes so much and takes up so much space needed for other things that it becomes a problem. Also another thing that Peter Walsh recommends is to honor those special things by displaying them or even using them so they don’t get buried in a corner collecting dust. Rana, I also highly suggest if it is an item you don’t really want to display but it is very sentimental, instead of holding onto the item you could take a picture and let the item go. You can journal your feelings attached to the item and any memories you have. This is a great way to pass on memories to the next generation that might just see this stuff as STUFF, I think it would be awesome to be handed down a book of photos and memories to remember past generations. Okay clothes are definitely tricky because of the various sizes and the cost involved to replace them. My advice to you would be to hang on to them because it’s been less than a year however I wouldn’t let clothes that don’t fit take up prime real estate in your closet. Perhaps you could box them up and tuck them away in the top of your closet for now. If you haven’t worn them in a year then really consider the space that those clothes take up and whether or not they’d still even be in style when you do go to wear them. You also need to consider the emotional toll that takes on you to open your closet and see those clothes that don’t fit over and over again. I would definitely say give yourself a little more time on the baby weight, you don’t want to rush into a decision on something that might fit in 3 months as opposed to now. If there is anything you know you didn’t love pre-baby then let it go. I keep a donate box right in my closet. Each time I put something on and I get that “what was I thinking” look I toss the item into the donate box. I find that I have my tried and true that I wear quite regularly however I also make sure that I try out some of those clothes that have just been hanging around to see if I really like them. Break out of your comfort zone and try something you wouldn’t normally wear and see if you even like it anymore. I have to admit I actually feel nauseous when I throw something away. When I donate things to Goodwill, I think about them constantly. I definitely have issues, there’s no question in my mind. But I have taken on your challenge – sort of 🙂 I’ve decided to organize my kitchen drawers, one at a time each Monday for the month. Last Monday I did our silverware drawer – what an absolute mess! This week I worked on our hardware/junk drawer – another mess. I actually purchased drawer organizers and LOVE THEM! You might have me organizing something every Monday from here on out! Thanks for the encouragement! Small steps like that is really awesome progress, way to go!! Your doing an awesome job Candi! Keep up the good work! Setting yourself up on a schedule may be the way to go, as you progress letting go will come easier. Everyone has to work at their own pace. This is so hilarious, because a lot of the things I might get rid of, my husband bought me. Alas, I KNOW he would be irritated. He hates it when I try to get rid of things I’ve spent money on. I have a STASH of yarn, and I’ve hardly knit anything in two years. I also have a ton of rubber stamps and crafting supplies that he refuses to let me get rid of. Why? Because I might use them with the baby when he gets older. And they cost money. He was fine with me getting rid of a ton of books because they were fantasy, and that’s not literature. So, the question is – how do I get rid of stuff without my husband knowing? And yes, I did move cross-country with all this stuff. So the moving thing won’t work. I think he’d be fine if I could sell most of it, but that is going to involve a lot of time photographing and figuring out shipping costs. So, of course, I haven’t done it yet. It’s also jammed into our giant, yet oddly useless closet (it’s super narrow but very deep). I’m really do believe that we have to remain respectful to our spouses in this process. What if the two of you sat down and together figured out a designated space for all these items, for instance that closet you spoke of. Then take some time to organize that space so that it works for you, it may require some creative storage solutions. Then whatever doesn’t fit “nicely” in this space you agree to get rid of. Make sure to label all the bins or drawers (or whatever you decide to use) so you know what is inside. It’s all about reaching a compromise that you can both live with. I completely agree with Laura, time to sit down with the Hubby and have a heart to heart. Perhaps once he starts seeing how things look once organized and realizes ho much space is taken up by things that you really don’t want to hold onto it might change his mind. If not see what he thinks about helping you sell items. It can be very time consuming however if he is up for the challenge then by all means let him. He make come to some realization there as well. That he would rather pend his time elsewhere and will grant permission to donate some things. You had perfect timing with this post! I just read an article yesterday about getting rid of “sentimental” clutter. That is my biggest problem area. You really nailed it when you said that we hold onto stuff because we think we will forget our special memories. I’ve stopped saving cards and paper memories, but I still have a lot of other items from early marriage and my “baby” years. Now that my youngest is 3, I wonder if I will forget how precious those baby years were to me. Ahh that’s awesome Melissa, comments like these are such an inspiration to others. Way to go!! This is a wonderful blog! Very inspirational. I love to read about organizing, and sometimes actually sort through things, but I’ve found it difficult to keep things orderly, especially paperwork. Keeping financial papers organized would help me towards my goal of financially fitness, but where to start? I went on a rampage and purged a TON of clothing and kitchen items last night…it felt fabulous!! I love the tips – i recently moved and got rid of tons of stuff – really downsized the “junk” – at the new house I was really careful where things went – but my problem now is remembering where everything went – so I am starting over going through things!! Hey I tried asking myself these questions…but my self…wouldn’t answer! hahaha….I’m not speaking to myself….this is a painful topic…neither one of us…me and myself ….can agree on whether to keep or let go,,,(big smile) and now that WE have read this article….I know one of us has to break the silence! Thanks alot….for a great…but painful article….yeah…thanks. I have been asking myself all those questions every single day that I’ve spent cleaning out my room, and ya know…I’m finding that I’m not too attached to some stuff anymore. I’m also discovering that if someone else can get some use out of something, then, by all means, I want them to have it! Oh yeah! That was writtent for me! Thanks… that put me in perspective! I have 2 sisters, all of us are about the same size. Twice a year (spring, and fall) we have a ‘sister clothing exchange” We have lunch and spend the afternoon trying on clothes. We all leave with a pile of “new” clothes. Whatever is not taken home goes to a consignment shop, and the money we make pays for a sister outing. Twice a year we go away for a couple of days, stay at a nice hotel, eat out, and shop. Consignment money usually covers the hotel, and a great meal. You are more likely to part with an item of clothing if you think that one of the sisters will enjoy it. The swap is alot of fun. By the way, we are all in our late 60’s early 70’s. Okay, I have been struggling for quite a while now. But my determination is in full force as I try to complete one area at a time. I have made enough progress to keep me motivated. This was my New Year’s Resolution to get organized. My mantra has been to not give up and there are days when I do things in 15 minute stints just so I don’t burn out. But one of my problems is that I am afraid to get rid of things, especially clothing. My fear stems from the fact that I do not have any money or resources to replace any of these items if I do need them later. Even the things that I do not fit. I might one day and then I might need them. I recently lost 13 lbs, ditched those larger jeans but only have 2 pair now that fit. Then I had a scare where I thought I might actually gain the weight back and NEED those other jeans. How do I reconcile these fears? In my purging I found that I keep things because I might need them again AND might not be able to afford to replace them. I did get rid of some (not all) of the uglier and out-of-fashion items. Due to a back injury several years ago I cannot wear shoes with heels any longer and I did get rid of those too. It felt like a weight was lifted off of my shoulders when I sent these items te the thrift store. There wasn’t any panic with them, just relief. But these other items are more challenging. Any advice? beautiful handmade baby blankets…3 to be exact. I am really enjoying reading all of these ideas and how everyone has a hard time getting rid of things. I try to keep organized. I just went through my kids clothes and everytime I go to clean the house I keep a plastic bag with me to throw anything away. It works for me. I just have a hard time organizing toys. What to get rid of and what to keep. I just don’t like clutter and things on the floor except for when the kids are playing. Let’s all keep clutter free. We are to store up treasures in heaven not here on earth. thought I got rid of a lot of stuff a few years ago. But it is still there. I moved from a 5 bedro0m home to a mobile park. So I brought lots of stuff with me. I have been slowly working in one of my sheds that it was to the point of being dangerous to walk into. It is about a third done, my trunk is full & 2 large boxes on my deck to go to someone who will love & need the things. Lots went in the garbage. Hope to finish this within the next two weeks, so some of the things that are in the house can go out. And be put in my empty space for the things that I do need. Getting rid of things I no longer need one box at a time. It took me so long because this all came about because of a 34 year marriage split. And I just couldn’t deal with it. I won’t need one of your happy mugs because I will be doing the ‘happy dance’. I bought organizational everything. Now where and how to start. I have hobbies such as painting, scrapping, knitting, reading and etc. I teach medical classes and have so much. I have books and props and years worth of endless work. I have the house to myself for almost 10 days and feel like if I don’t fix some of this clutter I will go crazy. I have 3 dogs and 2 cats, a teenager and well, we will call him the teenagers father. The house is not mine but all of the responsibility is. I just need a few tips on what to start with. A little direction. I have IKEA organizer furniture that I have acquired from Craigs list with much respect financially. I have baskets and cubes that fit into the furniture. I have clear tub organizers. I’m ready with the items. I just need the emotional push in the right directions. I’m also dealing with some important deadlines for work. That is an entire beast of its own. Any help would be great! I know this is an old post, hopefully you’ll see this. And forgive me if it’s already been asked. On the seeming ungrateful thing…. I was recently on a decluttering kick and got rid of tons of my kids’ clothes, many of them hand-me-downs. Shortly after I got rid of them, a friend who had given me some asked for them back because they were having a baby soon. Of course, I felt terrible that I had already donated most and I scrambled to get together a box of baby clothes and gave half-true excuses about not being sure which were hers. But that made my decluttering kick come to a screeching halt. I don’t want to get rid of things given to us because even when I have let go of the guilt, the giver will ask me about it later! That heaps on more guilt than keeping an unwanted item. How do I solve this problem?? If someone gives you baby clothes and then asks for them back after the kids outgrew them and you donated them. Just tell the truth that you have already donated the things your child has outgrown. For future reference maybe have a get together with the other parents for a baby item swap out session. Go to a restaurant and get a private party room. Set some of the tables along the wall with clothes according to size and put out whatever toys or other baby gear as well. Have some lunch and then draw numbers to see who goes first to pick and take turns. For bigger stuff maybe draw names out of a hat. You could do this a couple times a year but with as fast as kids grow maybe once every 3 months would be be about right. The private room also means the kids can be corralled more easily. We go to a local buffet for Chinese food with friends for various special occasions and someplace like that would work really well. You friend will understand and if not then you have to decide if you want to feel guilty or if you want to feel happy. Good luck!!! Last June/July, my husband and I purged, used the haven’t used it in a year. We managed to throw out 9 leg garbage bags of just junk, donated dishes, books,clothes, Christmas paraphernalia etc and yet its June again, closet stuffed to wall to wall, shelves of books. You would think we haven’t thrown any thing out. I do my best by following the theory of for example shop in your closet first, shop in your cosmetics before buying and yet you would think we’ve lived here 25 years instead of 5. How do I stop it from getting to big and overwhelming. Buy a pair of jeans get rid of a pair I do this and still have a mountain of clothes, mind you my weight dramatically fluctuates so I try to keep 3-4 outfits of each size. Please help I’m overwhelmed and getting lost in books, clothes etc. What is a person do purge monthly. And no I am NOT A HOARDER.